How are computer training desks used to improve functionality in commercial environments? 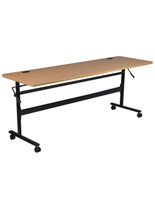 These seminar tables offer numerous configurations, finishes, and sizes to fulfill any corporate or non-profit need when it comes to setting up classrooms and work stations. Whether seating one individual, or a team, the right computer training desk ensures projects will be completed more efficiently. Starting with flip up tops, these versatile seminar tables quickly fold up vertically for storage. Just push the unit to the side or stack several of them in a closet when not in use. Most of these computer training desks include manual or electronic cranks so they are easy to maneuver. Sit stand workstations are adjustable to accommodate sitting or standing persons as they desire, for ergonomic health and comfort. Many of these seminar tables include monitor and printer cord management holes to keep the work area neat. Others feature built-in privacy panels and storage drawers. Each of these computer training desks is available in a myriad of finishes, builds, and price points. Expand work space instantly in small environments, or buy these stands to ensure shapeshifting options when rooms are designated for multiple purposes. This office furniture enables a space to be configured effortlessly for a large class discussion or small group activity. What seminar table designs are offered and what are their distinguishing features? 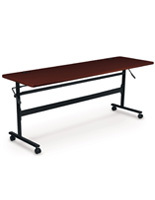 Computer training desks come in a range of sizes, colors, and configurations for commercial and private uses. Most of the styles featured here come in two sizes, all of them have a stain-resistant melamine finish, and are offered in a variety of colors, with a fixed build, or with wheels. Strong fabrication ensures durability. Use work tables for students in a classroom for distance learning and lab work. Set up singular study spaces for individual students using one of the technology carts. Set up a team of employees using the longer tables for projects. Basic presentation furniture is affordable and reliable, and never goes out of style. Create instant work space for school and art projects and paper grading, collating and mailings, phone-a-thons and fundraisers. The MDF construction and thermal fused melamine laminate finish ensures a reasonable price point plus durability with daily use. A thick 25mm surface and steel legs keep the area stable while people are working. This simple table comes in black alone or in combination with replicated woodgrain finishes in mahogany, dark walnut or oak on the other. Sit stand workstations with electric memory settings are easy and fun to adjust for reading, writing, and collaborating. Locking caster wheels ensure mobility so this ergonomic desk can be used by a single employee or as a joint workspace for groups. A four position programmable memory setting works remotely for one-touch height adjustment via 120” power cord. Keep the feet for permanent locations (levelers ensure the presentation is stable on uneven floor), or change them out with the wheels that are provided. Mobile flipper tables are easy to set up, move, and store due to the flip-top design enabled by a release-drop lever. Create a large workspace for a team of employees, or collapse the desktop and roll the unit to the side when large groups are expected for a conference or lesson. Numerous tables can be stacked together in a closet to leave room for increased foot traffic. This Greenguard-certified rectangular topper set is constructed of vacuum-formed PVC with a teak or mahogany melamine finish. Cable management openings support laptops, printers and other tech. Sit stand training desks with hand crank have an easy to operate manual handle that adjusts the table by height so the person can work sitting or standing for better circulation. A contrasting design with dark walnut woodgrain melamine on top and a light colored base adds interest. Cord management keeps the area neat and organized while an ergonomic design makes the desk comfortable to use. 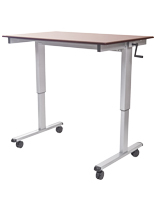 Electric sit stand table is a basic technology work station with incremental height adjustments to position the desk for standing or sitting use. The dual shelf design enables laptop and additional keyboard support and a shelf on the bottom holds a CPU or other electronics. 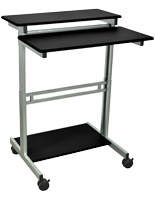 This small footprint cart is great for adding work space in a classroom, lab, or smaller office for using technology. Privacy panel tables are best sellers that come with or without locking drawers and storage compartments for personal belongings and supplies. Perforated modesty backers help delineate a presenter or teacher space from the rest of a class or study group in one room. Technology cords are concealed due to cord management or grommet outlet holes to neaten the workspace when a desktop monitor or laptop is used. This desk has a clever design that can be adjusted for sitting or standing. Technology workstations are all-in-one media carts for work and study that support a monitor or laptop, CPU, keyboard, mouse holder, and printer. With padded wrist rests for ergonomic comfort, this study station is great for a student dorm room, high school or college library or lab, professional or home office. 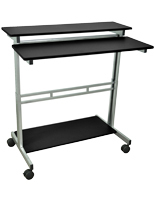 Multimedia carts are training desks with wheels that are inexpensive, without sacrificing quality and appearance. Replete with all the features you look for in a laptop stand, like a keyboard tray and shelves for paper and associated equipment - MDF carts with striking teak melamine finish are more affordable than wood - and caster wheels enable portability from room to room. Seminar tables in a simple style with fixed legs and top are inexpensive options for creating additional workspace. These stations are designed to stay in a fixed position - though they are light enough to move as needed. Most of the other training desks featured have wheels and flipper tops to allow the user to reconfigure rooms on short notice. 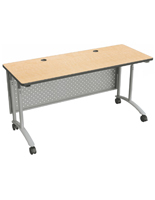 These seminar tables are great for meetings, homework, testing, lab work, art projects, number crunching, collating, envelope stuffing, phone-a-thons, and fundraisers. 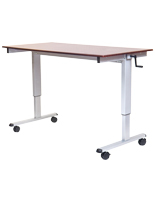 Use these desks at trade shows, expos, daycares, libraries, church fundraisers, hospital labs, and corporate boardrooms. These tables offer temporary workspaces without posing a storage problem, since they are easy to push aside or store in a closet. MDF construction and a sturdy steel base ensures durability with daily use. A melamine finish stands up to stains, dings, wear and tear. Available in square and rectangular shapes, this affordable office furniture is perfect for settings where activities vary from day to day. Each of these desks come in a myriad of heights, widths, and configurations to support teachers, lecturers, hospital workers, and business people. These tables are typically seen in daycare centers, school and college classrooms, trade show booths, and hospitals but they can be used anywhere. Perfect for fundraising, art projects, number crunching, test taking, lab work, and individual study, this affordable office furniture is a great investment. Some of these desks with wheels support laptops or desktop monitors, have cutouts for power cord management, and shelves for a printer, CPU, keyboard and mouse. Low-profile square mobile carts are great for temporary activities because they can adapt to myriad floor plans. Sit-stand desk styles with height adjustability enables seated and standing positions to reduce back and leg strain and promoting ergonomic health. Classroom workstations offer storage options like file drawers and locking compartments for supplies and personal belongings. Fixed tables without wheels or folding capability are simple work tables for organizational tasks and projects. When space is scarce, or large groups of people are expected, manually or electronically maneuvered folding carts offer quick vertical storage to create instant extra space. Office furniture with a built-in perforated modesty panel offers subtle delineation between a presenter or teacher and a classroom of students or lecture attendees. In addition to their space saving design for storage and easy mobility, these counters are affordable alternatives to hardwood due to their MDF construction. A super-durable melamine finish offers stain- and ding-resistance that holds up with daily use. Shop our website for this classy, quality office furniture or the website-at-large for associated items like multimedia carts, lecterns and folding chairs to outfit a corporate office space or boardroom, classroom, or convention hall. Shop in bulk to enjoy deep discounts - most units are shipped disassembled for more savings. 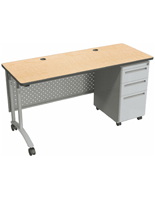 Each workstation is easy to assemble with the included hardware and instructions.